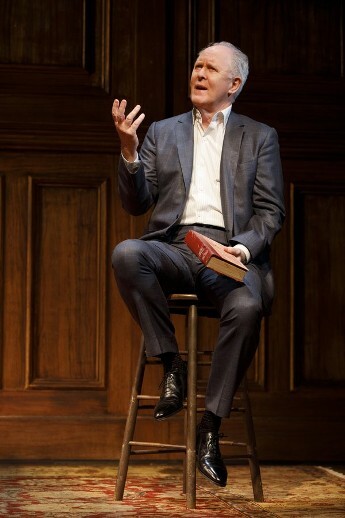 We all want to hear stories, says John Lithgow. A fair assumption, since the lanky Lithgow is greeted by a sizable audience at the American Airlines Theatre, all settled down to watch him enliven a collection of colorful characters in his ebullient one-man show, John Lithgow: Stories by Heart. Why are stories generally so universally engaging? Lithgow asks and answers this question in a two-act Roundabout Theatre Company production. So Lithgow begins to read to us. Actually, he reads a few lines from a well-worn book, and then puts it down and performs the stories. Except for the book, no props are necessary. With the buoyant charm of a favorite neighbor, the voice of an eloquent professor and an elastic physical prowess that has served him as a poignant leading man, a scintillating wit, a flat-out silly comic, Lithgow is masterful. He reads from an old family book, Tellers of Tales, edited by M. Somerset Maugham, from which the four Lithgow children had listened as their father read to them at bedtime. Now Lithgow reads to us, "The Haircut" in Act I and "Uncle Fred Flits By" in Act II. In addition, there is a third story linking them all, the memories of an usual family. The current Stories by Heart, directed by Daniel Sullivan, has evolved over ten years from an early production at Lincoln Center, directed by Jack O'Brien. Here was when additional personal reminiscences were added, the influence of his Lithgow's indefatigable actor/director/theater impresario father, Arthur Lithgow, and his mother, Sarah Jane who left the stage to become a "cheerful, unflappable road manager” of the struggling family. The stories of his family are highlights in young John's life and they helped direct him to the theater world and storytelling. As Lithgow points out, "All theatre is stories and all actors are storytellers." The story in Act I is Ring Lardner's, "The Haircut," Lithgow fussing around the imaginary Midwest shop as the prattling dunderhead barber, chortling and gossiping about local cronies to a new customer. Snapping the cape around the customer's neck, he chooses a shaving mug, mixes the soap, shaves the face and swipes the shaving blade down the strop. With Lithgow's keen acting monologue and sharp sound effects, the tale gradually shifts into a deeper and darker plane of small-town jealousy and retaliation, yet the entertainment value is often strained and limited. Act II is meatier, funnier, and more touching. Reading P.D. Wodehouse's "Uncle Fred Flits By" is connected to Lithgow's father, now aging, ill and deeply depressed. To lift his spirits, Lithgow decides to read him the Wodehouse farce, a childhood favorite about a British eccentric and mischievous Uncle Fred's upcoming visit. Lithgow enlivens all ten spiffy characters, including the parrot, his face a comical medley of impossible grimaces, his voice a mercurial collection of sounds, human and avian. It is tailor-made for Lithgow's sweeping physical hilarity, poignantly underscoring a man desperately trying to care for his aging parents. The stories are presented on John Lee Beatty's set, which is spare and wood-paneled with a wing chair, stool and table. Kenneth Posner raises the house lights at the top of the show and then lowers to a moodier design. Back to the earlier question, "Why are stories generally so universally engaging?" Lithgow found a personal value in the healing power of story-telling. Reading the written words of "Uncle Fred Flits By" to his aging parents at bedtime seemed to offer them the same sense of comfort, safety, and laughter as Arthur Lithgow had conveyed to his youngsters snuggled on his lap at bedtime. The production is a charming reminiscence over some cold winter hours. 227 - West 42 Street, NYC.